Wave heights eased off over the weekend with exposed spots fairing the best with favourable winds and not too much size. The Mornington Peninsula eased from 3-5ft Saturday and then down to 3ft Sunday while the Surf Coast was tiny. Today the swell remained small to tiny on the Surf Coast while the Mornington Peninsula offered 2-3ft sets with an early N'ly but this has since shifted NW and is increasing. A late SW change is due across the coast as the swell remains slow. This afternoon's change was supposed to be linked to a cold front bringing with it a new SW groundswell for tomorrow, but the system weakened through the weekend and no we're looking at a continuation of small waves with onshore winds through tomorrow and Wednesday. It won't be worth a look with fresh S/SW winds tomorrow and moderate S/SW tending SW winds Wednesday. There's a slim chance for an early W'ly around Torquay Wednesday morning but it won't be worth the drive from Melbourne. Thursday should see clean conditions during the morning with light local offshores but the swell will still be small and around 1-2ft on the Surf Coast with 3-4ft sets on the Mornington Peninsula. A slight kick in size is due into the afternoon but SE winds will create average conditions. Friday unfortunately looks average again with an easing swell from an inconsistent 2ft on the Surf Coast and 3-5ft on the Mornington Peninsula with SE winds. 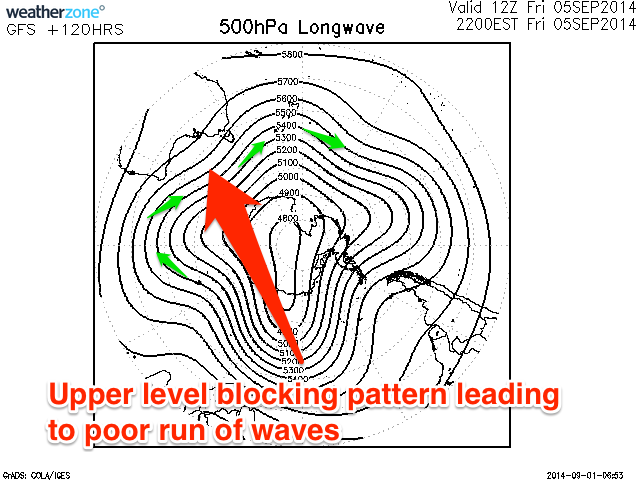 There's going to be no change to the current weather pattern we're in looking into the weekend and next week with the upper level weather indicating a general blocking setup continuing until at least early next week (from which we may see some better W/SW swell). Winds should improve over the weekend for exposed spots, so it'll probably worth making another trip further afield with the lack of swell. This has to stop soon, surely..